Pet owners whose dogs are calm and relaxed during veterinary or grooming appointments are more likely to visit the vet or groomer more often. Owners of dogs who are frightened or act out tend to put off routine care and wait until whatever is wrong has been wrong for awhile, making the next visit even more unpleasant. Do you put off trips to the vet or groomer? Why? Because experiences that are positive are reinforcing and likely to be repeated and experiences that are unpleasant or embarrassing are likely to be avoided. If your best friend trembles and is distressed, you will tend to avoid situations that make them feel that way. If he growls, if the vet or groomer has to muzzle him, if you are embarrassed about how your pet is behaving or upset about the way your pet is handled, you will avoid being in that situation again. There are great veterinarians and groomers who do their best to provide a low-stress environment and gentle handling. Unfortunately, there are also veterinarians and groomers who manhandle and force animals into compliance. Some will ignore your dog's discomfort and just push ahead to get the job done. Wham bam, thank you, ma'am. Get 'er done. It's a bad sign if they use phrases like, "You can't let him get away with this" or "you have to be dominant." Worse, if they proceed to demonstrate how to physically correct your dog to "show him you're in charge" rather than show you how to help your dog feel less stressed and more relaxed. Shut down is NOT relaxed! ​A good practitioner will be aware of how your dog is feeling and will help them feel more comfortable before proceeding. They are patient with their patients. They know that a good experience today will make future visits easier. Rushing to get it over with isn't the answer - time well-spent now will make future appointments go faster. You are your dog's advocate. If you aren't comfortable, say so. Ask for clarification. Ask for time to let your dog regroup if you think your dog needs it. If their interpretation is that your dog is being stubborn, and you know he's resisting because he's afraid, say so. Suggest a different approach. If you aren't okay with what's happening, speak up. Your dog can't. If the practitioner is not treating your pet in the way he deserves, find a new vet or groomer - or trainer! Your dog's comfort and staff safety must both be a priority. Training & positive associations can help! Let's face it. There isn't much about medical treatment or being bathed, blow-dried and clipped that is "fun" or comfortable. Staff must be kept safe. The animals they are handling have sharp teeth! It may not be fabulous, but it doesn't have to be unnecessarily traumatic. Which is why so many veterinarians and groomers are learning about Low-Stress Handling Techniques and behavior assessments to help their clients and their animals have a less-stressful experience while in their care. Preparation is up to you! It will take training and practice. You will need to make time to help your dog learn skills and have positive exposure to the sights and sounds of the veterinary clinic and grooming shop. The vast majority of his experiences there should be positive in order to outweigh the parts that aren't. Visit as many vet clinics and grooming shops around town as you can - just to eat amazing, high value rewards in the waiting room. 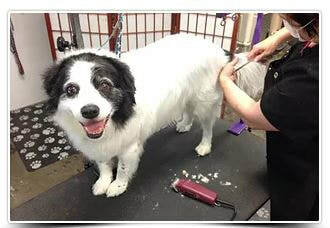 Your dog should love and trust his veterinarian and groomer as much as he trusts you. People often say that the 'dog had not reason to bite and gave not warning' - not so! We just did not realize either the reason or the warning the dog did give. 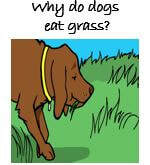 “Why do dogs eat grass?” My veterinary colleagues and I are asked this frequently and we honestly do not know the exact reason or reasons. Damaged toenails are extremely painful at the moment of injury. In many cases, pain will persist until the damaged portion of the nail is removed by a veterinarian.